If you have a lot of IP cameras in your home, how can you view their video streams all in one place? This is the job of the humble Network Video Recorder, or NVR. An NVR is a central device that can manage all your cameras, and even take a backup automatically in real-time. This is truly invaluable and a critical component of a well-planned smart home strategy. So how do you choose the right NVR when you have a large number of security cameras, especially if they are from different brands? 32-channel NVRs hit the sweet spot between 8 and 64-channel NVRs. But they often have an incredibly wide range of prices and its not easy to figure out what the real differences are between them. There’s no industry standard way of comparing them and that’s why in typical VueVille fashion, we have done the in-depth objective research leading to recommendations you can trust. 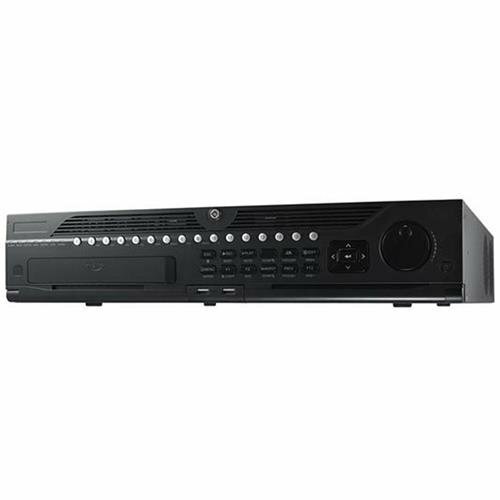 If you are wondering what an NVR is, check out my in-depth NVR buying guide, which will also explain the basic difference between a DVR and an NVR. I recommend selecting the cameras you want from a single manufacturer like Dahua or Lorex, and then finding a suitable NVR to go with it. This is because you should be picking the cameras you need for the intended installation location. You may notice that the high-end NVRs in this article do not have PoE. What, Daniel you are cheating you say? 🙂 Well for more advanced installations, you don’t usually power the cameras from the NVR, instead a dedicated PoE switch is better. The advantage is that you avoid the NVR becoming a single point of failure for your cameras. What to look for in a 32-channel NVR? Maximum resolution supported when recording 32 cameras: Some NVRs have a headline megapixel capability, but the fine print may reveal that it can achieve this resolution only with 8 cameras, not all 32! So watch out for this one. Encoding: H.264 is the most common standard, but the more efficient H.265 standard can help reduce the file size of video recordings. Number of PoE channels: Some NVRs may have on-board PoE ports which is very convenient. But no 32-channel NVR is going to have 32 PoE ports. If you need that many PoE ports, you may have to get a PoE switch and plug that into the NVR. Advanced motion detection: The best NVRs support not just basic motion detection but advanced methods such as line-crossing or tripwire, intrusion detection and even face detection. You will have to ensure the NVR and camera brand are the same if you need the advanced motion detection methods. For example, Hikvision NVRs cannot access the advanced motion detection abilities of Dahua cameras even though you can plug in a Dahua camera into a Hikvision NVR as they both support the ONVIF standard. If there are no PoE ports, no worries, just get a PoE switch. Pre-record: All NVRs can start recording after a motion detection event occurs. But what you really need is a pre-record feature where the NVR will also record the precious few seconds before motion was detected. Storage capacity and disk mirroring (RAID support): Look for the ability to automatically record to mirror the data that is recorded to one hard drive to a second one. This is called redundant storage or RAID. The reason for doing this is so that you will have a copy of the data should one of the hard disks fail. Of course you should take a weekly USB backup to a separate drive that is ideally stored off-site. 3rd party camera support: Not all NVRs allow you to hook up 3rd party cameras. Look for ONVIF support and explicit 3rd party camera support on the specification list of any NVR you are considering. Alarm in/out: This is essential to connect the NVR to the rest of your smart home, burglar alarm or office security system. You can connect it to the NVR so that it can start recording if the PIR motion sensors detect motion or if a door/window sensor is set off. Audio in/out: You can use the audio out if you are using the VGA output of the NVR to live-view on a monitor. The audio in port is good for a microphone if you want to record audio other than from a camera source. 32 IP cameras would look great on this house. 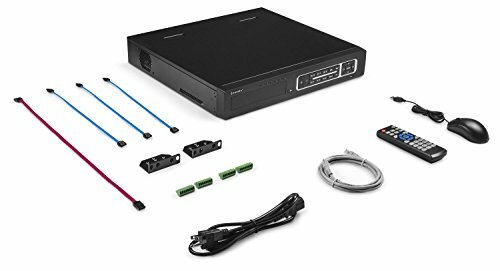 How do I use all 32 channels of these NVRs? No 32-channel NVR is going to have 32 PoE ports, so you have to use a PoE network switch. First plug all your cameras into the PoE ports available on your NVR except one – we will need this for the PoE switch. Plug your remaining cameras into the PoE switch and then the switch into the NVR port you saved for the switch. If your PoE switch is too far away from the NVR, just connect the switch to your network at any point. This is the beauty of IP camera systems, your NVR will be able to find and add the cameras as long as they are somehow connected on your network. They need not be physically attached to the NVR itself. Amcrest security cameras and NVR kits are attractively priced good quality products and have become quite popular as a result. They also sell NVRs without any bundled cameras and the NV4432E-HS model is my pick for the best budget 32-channel PoE NVR. 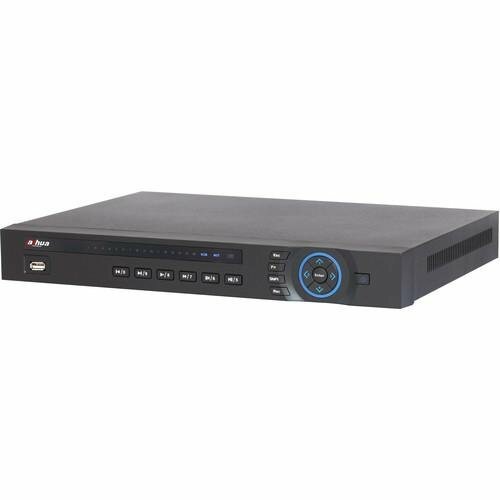 This NVR can record Amcrest’s own security cameras and any ONVIF compatible IP camera from other brands. The maximum resolution supported is 8MP and it can record all 32 channels at this resolution along with audio. You can install up to 4 hard drives with a maximum capacity of 6TB, making a total storage capacity of 24TB. Now you may think this means the NVR supports redundant recording on these internal disks, but that’s not the case. You can assign different cameras to record to different disks, thus spreading the load over multiple hard drives. You will also find 16 PoE ports on the back of the NVR. Other interfaces available include a serial port (RS-232), an eSATA port, VGA and HDMI out. Thanks to the 16 alarm in ports, you can also hook up motion detectors or other triggers from various zones too. 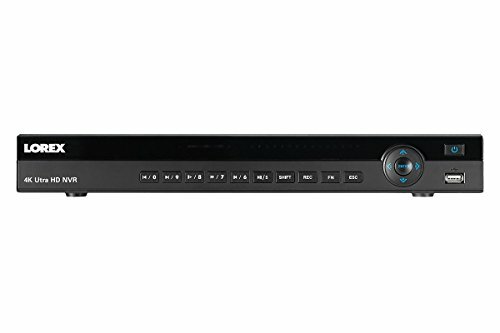 This NVR can display all 32 channels simultaneously when live-viewing and playing back recorded footage. Mobile apps are available for both iOS and Android. Backups have not been forgotten with a backup manager that helps you to take periodic backups to a USB drive. Taking regular backups to a USB drive stored off-site is critical to ensuring your data remains safe and accessible at all times. Here’s a link to the product datasheet (opens in a new tab). If you do not need advanced motion detection methods, but need drive mirroring (RAID), the Lorex is worthy of consideration. Lorex cameras and NVRs are mostly rebranded Hikvision and Dahua products. So quality generally tends to be on the higher side. However they do have an annoying policy of restricting their NVRs to work only with their own cameras. Even Lorex cameras that are just rebranded Dahuas often do not work with Lorex NVRs. So be aware of this before you invest. The NR8326 model sits within the ‘Extreme Security’ product line and is a step up from their basic models. This model can record all 32 channels at 4MP resolution along with audio without breaking a sweat. Up to 4 internal drives are supported plus an external drive suing the eSATA port. The standout feature of this NVR is its ability to mirror hard drives. Lorex doesn’t call it RAID but practically that’s what it is. Another party trick is the ‘Real-time Backup’ feature which can record the live-view screen to an external USB drive. There are 16 PoE ports at the rear, pretty standard for a 32-channel NVR. You will find a wealth of interfaces such as HDMI, VGA, audio in/out, serial port, and an additional USB port that can be used to add a mouse. Let’s look at the software side of things now. The user interface is basic but functional. There is a quick menu which gives you access to the most frequently used actions and settings such as views, PTZ controls, and sequence mode. In live-view mode, you can display up to 16 channels at a time. The different recording modes available are: continuous, motion, schedule and manual. When the hard drive(s) is full, the NVR will automatically start overwriting the oldest video recordings. However you can also set it to stop recording instead when the disks are full. When you want to play back recorded video, you can either pick a point on the timeline or use the smart search feature. The smart search feature lets you define an area of the frame in the recorded clip to analyse for motion. This is a great time-saver if you record in continuous mode and want to check whether there was motion in a specific part of a camera’s scene. Like any good NVR, the Lorex also supports backup on demand to a USB drive. So now we move up to the high-end options where you can get not just RAID but advanced motion detection like line crossing and intrusion detection. I have been using Hikvision stuff for many years now and my oldest Hikvision has been running non-stop for 3 years now. The DS-9632NI-I8 model is a powerhouse of an NVR and is able to record all 32 channels at up to 12 Megapixels. However it can only display or playback 16 channels at a time, at 1080p each. Surprising especially as it has two HDMI outputs. Still being able to drive a 4K display is pretty sweet. You can set the exact order of channels in a multi-channel view. Hikvision fully supports the ONVIF standard, so you can be sure that your non-Hikvision brand cameras will work with this NVR as long as they are ONVIF compliant. Some examples of supported third party brands are Acti, Arecont, Axis, Bosch, Brickcom, Canon, Panasonic, Pelco, Samsung, Sanyo, SONY, Vivotek and Zavio. What about storage? Here once again this NVR’s premium nature shines through with up to 8 internal hot-swappable RAID drives and a hot spare option (n+1 mode) to provide fail-over for extreme reliability. RAID0, RAID1, RAID5, RAID6, and RAID10 modes are supported. The various recording modes supported are: continuous, manual, alarm, motion detection, and scheduled. Hikvision calls the advanced motion detection methods VCA. You can also set 8 different time periods with different recording modes active for each of those 8 time periods. So you could have continuous recording during the night and motion detection recording during the day. Face detection, face recognition, vehicle detection, behaviour analysis (entering, exiting, loitering), people counting, parking detection, missing object, unwanted object and heat map are the fancy events that you just can’t find elsewhere. When its time to playback video, in addition to the timeline markers you can use the advanced search tools to help you find what you are looking for. These include face search, behaviour search, object search, people counting and heat map. The heat map function is used to analyse presence of people in the scene and how long they linger in a particular area. Backing up data is handled exactly as you would imagine with USB and eSATA interfaces available. Hikvision has a confusing range of mobile apps these days, but the one recommended for the DS-9632NI-I8 is the one that has been around the longest, iVMS-4500. Samsung? Samsung makes NVRs? Yes they do. Well actually they acquired a company called Hanwha Techwin that makes NVRs. And pretty good ones too. So this is a brand to consider if you are venturing into the premium end of the pool. The XRN-2011 has a very professional looking user interface which is what you would expect from a premium brand like Samsung. We hope the round-up above has made what is really a tough decision a bit easier to make. 32-channel NVRs are a siginificant investment, so if you have any questions please do leave a comment below or contact us on social media and we will try our best to assist you.